What goes well with naked duck breast and garlicky green beans? Potatoes. Crispy potatoes. 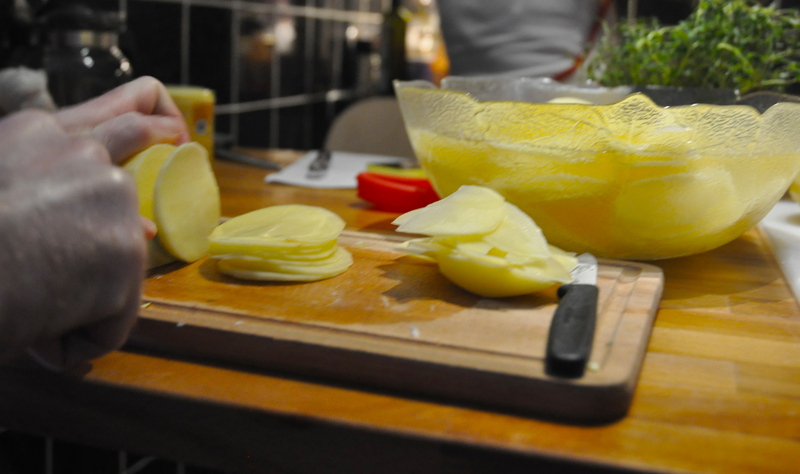 Thinly sliced potatoes. With layers of buttery leek and garlic. And thyme. Mmmmhhh thyme. 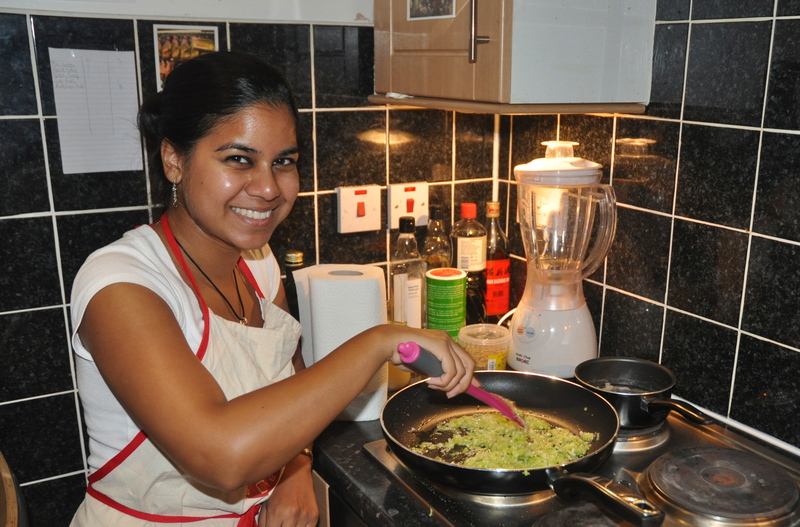 This post is part of the Weekend of Food series. Read more about our adventures here. This potato side dish doesn’t have that many ingredients, but it is a little tricky to make. Unless you have one of those mandolines that slices potatoes for you, that is. I don’t have one of those. Recipe inspired by Sam Cooks Food. Amount is based on making around 10 potato stacks. Adjust accordingly. Preheat oven to 190 degrees Celsius. First, the potatoes. 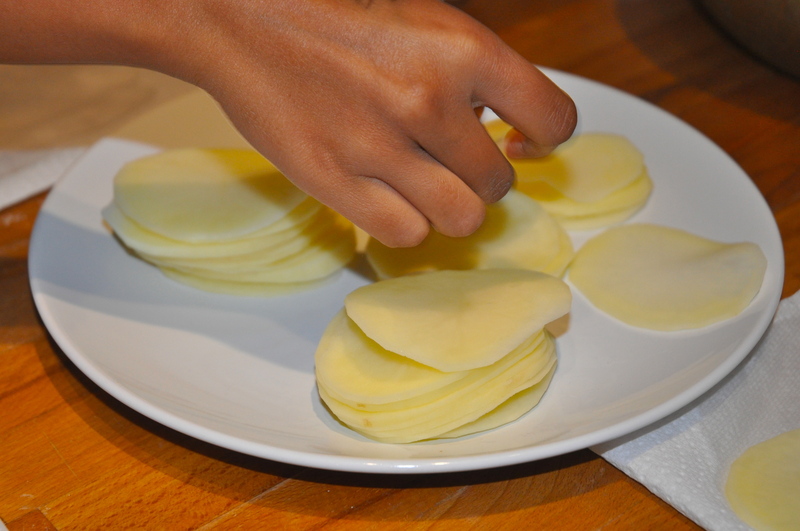 Peel and then slice them vertically very, very thinly, so that they are almost translucent. As mentioned, this works best with a mandoline. If not, it requires a sharp knife and a lot of patience. Put the slices in a bowl of cold water. Heat a non-stick frying pan over medium heat, and melt the duck fat and butter. 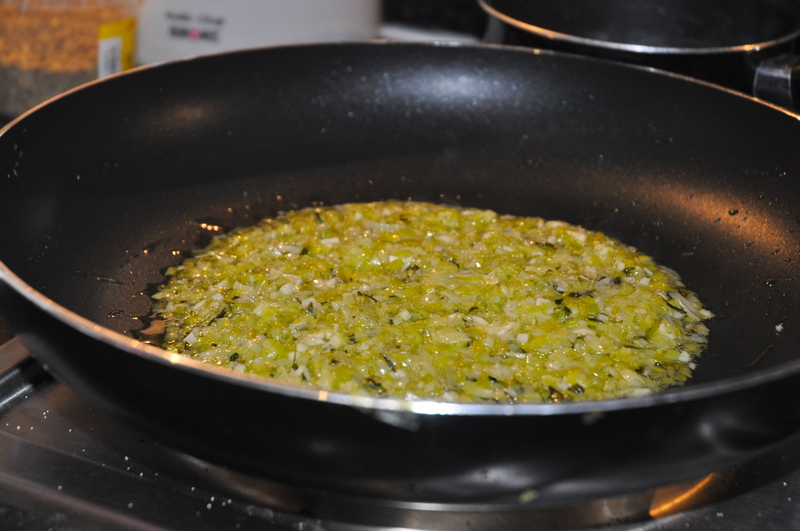 Fry the leek, garlic and thyme with the salt, slowly, for about 10-15 minutes. Fry gently until everything is completely soft and oozing deliciousness. Then, the tricky bit. Take the potatoes out of the cold water and dry thoroughly on kitchen tissue. Line up the slices according to size, making stacks of 10-12 slices each. If you have one (I really need to equip my kitchen better), you can use a round cutter to make equally-sized rounds, which saves a lot of time. Line a baking tray with tin foil and make the stacks by putting a slice of potato, a spoonful of the leek mixture, then another potato, then some leek, and so on and so forth until you have a stack about 10 slices high. Top off with a sprig of thyme. 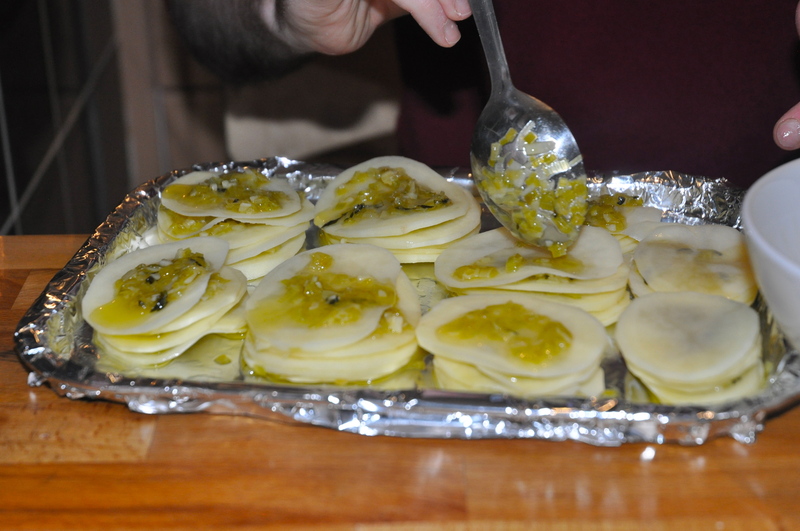 Put in the oven for about 40-60 minutes, turning to temperature down to 160ºC after about 20 minutes. 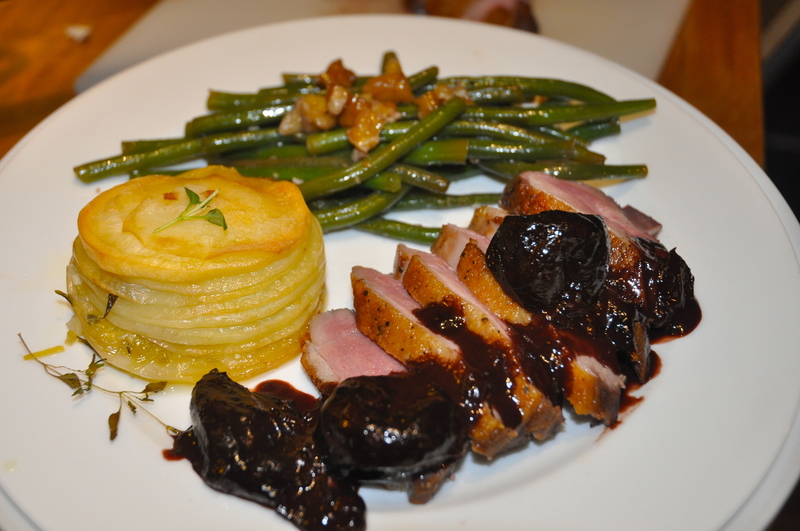 Serve with delicious naked duck breast and garlicky green beans in walnut oil. EDIT: I found a mandoline in the cupboard about a month later. I cannot describe my feelings. Thank you!! I’m so glad you like it. I love your dessert recipes, and we use the same blog theme so we should definitely support each other 🙂 How did you find me? Enter your email address to follow The Swindian and receive new posts by email. Breakfast in the sky at Duck & Waffle - worth it?